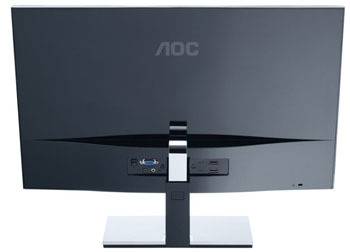 Monitor manufacturer AOC's latest 27in LED monitors aim to marry good looks to attractive street prices. A case in point is the £230 i2757Fm myPlay, touting a 1,920x1,080-resolution IPS panel and some cool new technology called Mobile High-Definition Link (MHL). 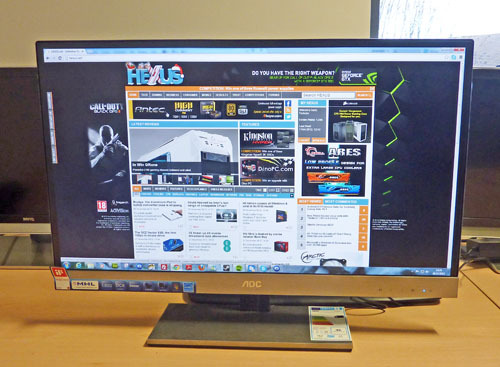 The i2757Fm is an attractive monitor that belies the bog-standard price tag. A compact, non-height-adjustable stand provides solid support for the 27in panel, which can be tilted +/- 15°, but there's no further movement in any way. The arm attached to the rear of the screen is designed in such a way that the base isn't actually needed; the monitor simply sits lower down when used without a base. Though giving the appearance of being constructed from brushed aluminium, the base and bottom portion of the screen are plastic, but it's well-finished and doesn't feel cheap. Aesthetics are certainly helped by having a near-borderless bezel - measuring just 9.5mm - and a slim profile, which, however, leaves no room for USB ports. Five touch-sensitive buttons are the only interruptions on the minimalist front. A closer peek at the back reveals that AOC uses a brick-type power adapter instead of integrating the PSU into the slimline chassis. Video inputs include VGA and twin HDMI, through which audio can be carried to a couple of integrated speakers. Sound quality is tinny and merely adequate more than arresting, as you might suspect. The monitor features a 3.5mm analogue jack and headphone-out, too. The lower HDMI port also serves as a conduit for MHL technology. In a nutshell it is yet another proposed standard for transporting audio and video from a smartphone/tablet to a compatible screen, much like HDMI. 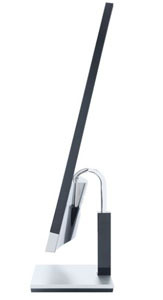 But a key benefit of MHL technology over HDMI rests with the ability to charge the attached portable device. Another MHL benefit, that of controlling the attached device via the display's remote control, isn't applicable here for obvious reasons. Though outside the remit of this editorial, some form of wireless full-HD receiving from tablet to display would be a really neat feature. AOC implements a nice-looking OSD that, like most others, sets the out-of-the-box screen at near-maximum brightness. The OSD provides seven sub-screens that delve into reasonable detail, including manually-inputted RGB settings under the 'user' mode. Certain options are greyed-out if using a digital HDMI connection. All-in-all, it's a solid OSD that has enough options to enable decent calibration. Look closer at the thin bezel and it's actually two bezels in one. The 9.5mm main bezel is enveloped by a smaller (2.5mm) surround. Both can clearly be seen in everyday use but don't detract from the screen's attractiveness. Switch it on and the AOC i2757Fm produces an image that is best described as being cool, even though it's set to warm in the OSD. Panel brightness, contrast, and uniformity are all good. Once calibrated, image quality is pleasing, with inky blacks, solid whites, and punchy, vibrant colours. Viewing angles are typical for IPS, meaning excellent horizontally and average vertically. Gaming, too, is an enjoyable experience, helped by the large screen real estate and super-thin border. The one elephant in the room that has been conveniently ignored so far is the 1,920x1,080 resolution on a 27in screen. 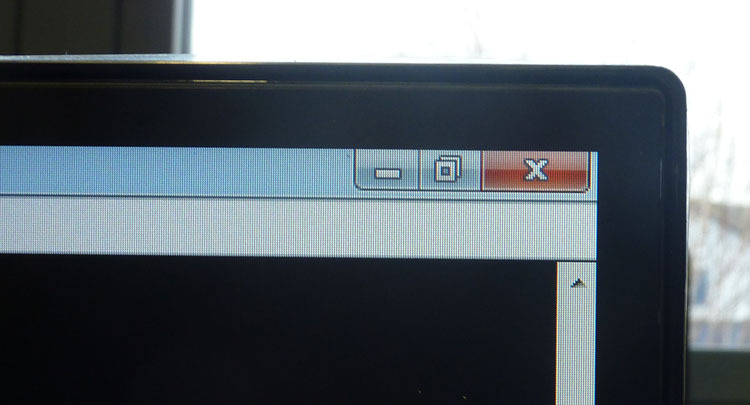 A large pixel pitch and low DPI translate to text and icons looking considerably larger than normal - full-HD monitors are usually between 22-24in - but the this-is-too-large effect fades quickly. We'd obviously have liked a higher resolution, say 2,560x1,440, yet understand that it's unlikely at the £230 price point the AOC is pitched at. W-LED technology is frugal enough to keep at-mains power-draw down to 30W in the out-of-the-box settings, dropping to 23W when calibrated to our personal tastes. The reported figures are actually more competitive than other 27in monitors we've looked at in the past. 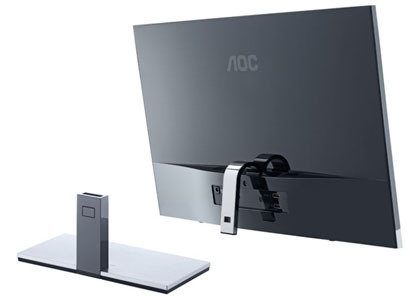 The AOC i2757Fm takes a solid IPS screen, wraps it inside a rather good-looking chassis and produces images and video that, once calibrated, are decent for the £230 outlay. In an ideal world we'd like to see a broader range of inputs and USB 2.0 ports - though understand AOC's e2752VQ suits that purpose - and a stand that has more flexibility. 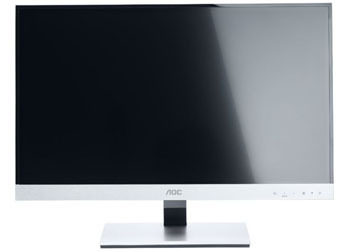 But as it is, AOC's MHL-equipped monitor strikes a respectable balance between looks, features, performance and price. The AOC i2757Fm is available to purchase from Scan Computers. What is the purpose of having a 27" monitor that's only 1080p? LOL. What's the catch? It's missing 2.3 million pixels compared to a proper 27“ computer monitor. Might be okay for watching a movie or console gaming, but bugger all use attached to a computer to get some serious work (or serious fun) in. And how does Hexus report this. Doesn't mention at 1080p is a terrible res for a 27” screen and simply says “Resolution could be higher” in the list of bad points. When measured as a computer monitor this should get 1 or 2 starts out of 5. Its good to see companies actually tackling panel quality first than E-PEEN(just like with the MP wars). Would be helpful to note whether the screen can handle 24hz playback on the HDMIs (eg. sub 60hz) for blu-ray etc, as a 27" 1080p IPS screen would be at its best for movies etc. If it really had a thin bezel instead of this blatant attempt to deceive the consumers, it would be a great option for Eyefinity.